- In the cover we see Orlumbus in his room putting away his clothes. - First pages is a double page with "New Marineford". Amazing illustration. - Sakazuki is talking with T-Bone about Fujitora. - We can see 4 new King/Queens from Reverie. - Neptune arrives with Shirahoshi and his 3 sons. Garp has been escorting them. - Sterry is in shock when he sees Garp. - Fujitora and Green Bull talks in Mariejoa. We can only see Green Bull shape, only part of his/her face (I can't say if is a man or woman). - Sterry sees some crows and he's afraid. A soldier says it's all OK, he's Sabo. - During conversation between Sakazuki and T-Bone, Sengoku and his goat appears. - One of the Kingdom in the Reverie is "Roshwan Kingdom". - Attach is one of the photographer that is taking pictures to Shirahoshi. - New Revolutionary members are a Mink (a giraffe with horns? ), a guy with an egg-shaped body and mustache, and a girl that seems Robin (she's not the real Robin, obviously). Hört sich alles sehr gut an. Sabo bleibt cool in der Nähe von Stelly. Dazu gehört schon einiges nach der Vorgeschichte. 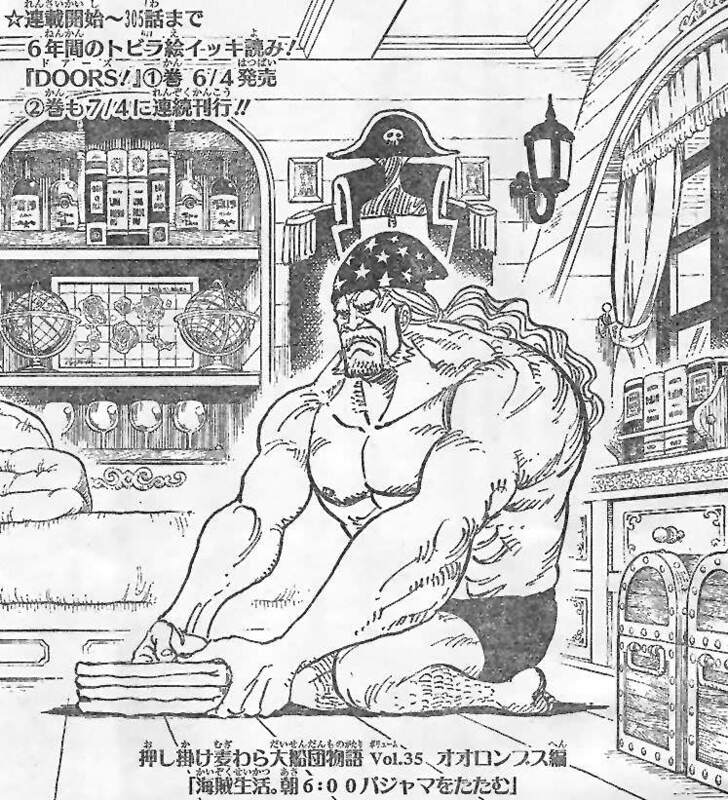 Fujitora ist mutig und wagt sich in die Höhle des Löwen, bin gespannt wie das Treffen mit Akainu abläuft ohne Kopf von Ruffy und Law ;-) Auf Green Bull bin ich auch gespannt, vielleicht diesmal eine Frau? Bin gespannt was Vegapunkt gebaut hat um die Samurai überfällig werden zu lassen. Ich vermute das er Pazifista auf dem Level eine Samurai oder Admiral erschaffen hat. Das würde mich sehr freuen. Oh man ich freue mich schon darauf, T-Bone, Attack und Sengoku's Ziege wieder zusehen. Ist immer schön alte Charaktere wieder zusehen. Vielleicht kommen ja Hina, Jacko und Fullbody auch in dem Arc vor. Jeder der Admiräle hat bereits ein fortgeschrittendes Alter, so wohl auch Ryokugyu. Daher kann Ryokugyu auch eine Frau sein mit einem kantigeren Gesicht. - On the cover we see Orlumbus guarding his adventurous clothes, his room is full of books, maps and travel material. - The chapter begins with a double page where we see "New Marineford" in all its splendor. They explain that it is attached to the Red Line and just below Mariejoa (which is on top of the Red Line). - Sakazuki is talking to T-Bone about Fujitora (I do not have a translation yet, so I do not know the details of the talk). - We go to the port of the World Government of the base of the Red Line. There are arriving the boats of the kings that go to the Reverie. - We are introduced to 4 new kings / queens (one goes with 4 women who look like a matrioska, we also see a queen drinking a drink and another with a poncho and a Mexican hat with a cactus). - The looks are focused on the arrival of Neptune and his children, but above all on Shirahoshi. Garp has been the one who escorted them to Mariejoa. - Shirahoshi hallucinates with the things she discovers, people do not stop taking photos. Morgans is presenting and hallucinating when he sees the princess ningyo. - Sterry (it's his official name) appears in front of Garp, is a little scared and remembers his childhood. He has a little talk with Garp (again I do not know what they're talking about) and ends up even more scared. - I do not know why but Neptune grabs him by the head, Sterry's wife faints. Sterry seeing all the gyojin goes back to scare and also ends up being unsullied. - Neptune and the rest climb into a small boat with which they start to climb Mariejoa, Shirahoshi says goodbye to Garp and he does the same smiling. - The boat climbs thanks to the bubbles (like those of Sabaody). When they reach a certain point, Shirahoshi is dazzled to see the immensity of the sea (beautiful double page again). - We go to Mariejoa, there chat Fujitora and Ryokugyu (who is lying on a lounger). We can not see Ryokugyu 100%, just a small silhouette and his face completely shaded. You can only see her mouth and nose and her hair is a little long. 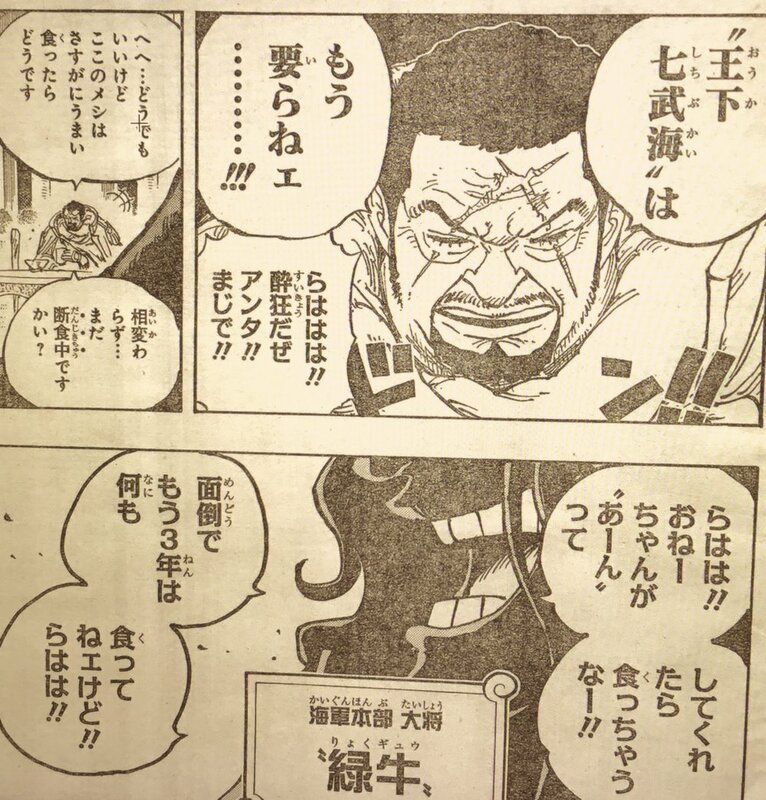 - Ryokugyu asks Fujitora for Vegapunk, he tells him that he is fine and that he has finished something "incredible". Ryokugyu asks what it is about and Fujitora says that with his new creation, the Ouka Shichibukai will not be needed again. - We passed to the Kingdom of Kamabakka, the 4 Commanders of the Revolutionary Army have arrived, in addition there are more members that we did not know in the meeting. - After 3 cartoons we went back to the boat that goes up to Mariejoa, there is Sterry with another of the kings. - We see a flock of crows that moves away, Shirahoshi is surprised to see these creatures. - Sterry is scared again (it's a capo XD) but a soldier tells him nothing's wrong. It's Sabo. Freu mich schon auf Garp, ist glaub ich sein erster Auftritt nach dem Time Skip.